Today In Miami at the age of 83 passed away a well known Russian and American automata theory scientist Leonid Rosenblum. He was my mentor and closest friend. Here is some brief information about his career. In Russian. Леонид Яковлевич Розенблюм (5 марта 1936 г. – 2 апреля 2019 г. ), канд. техн.наук, доцент – пионер мажоритарной логики, самосинхронной схемотехники, теории и применений сетей Петри в моделировании и проектировании цифровых схем и параллельных систем.В течение 20 лет, с 1960г. по 1980г., занимался с коллегами (в группе профессора В.И. Варшавского) наукой и приложениями (например, разработкой новой схемотехники и надежных бортовых компьютеров) в Вычислительном центре Ленинградского отделения Математического института им. В.А. Стеклова АН СССР. С 1981г. по 1989 г. работал доцентом кафедры математического обеспечения и применения ЭВМ в ЛЭТИ им. В.И. Ульянова-Ленина (ныне Санкт-Петербургский государственный электротехнический университет). В 90-х годах после эмиграции в США работал адъюнкт-профессором в Бостонском университете, а также исследователем в Гарвардском университете. Соавтор/автор пяти книг, около двух сотен различных изданий, учебных пособий, статей и обзоров, более 40 авторских свидетельств на изобретения. Среди его учеников – профессора университетов России, Великобритании, США, Финляндии и других стран, сотрудники институтов АН Российской Федерации, таких как Институт Проблем Управления, а также известных отечественных и зарубежных компаний, таких как Intel, Cadence, Xilinx и т.д. Леонида Яковлевича отличало врожденное свойство видеть в людях только положительные качества, помогать всем и во всем, и конечно необыкновенное чувство юмора. Эта утрата для огромного числа людей повсюду, всех кому посчастливилось его знать или слышать о нем. Leonid Yakovlevich Rosenblum (March 5, 1936 – April 2, 2019), Cand. Technical Sciences, Associate Professor – a pioneer of majority logic, self-timed circuit design, theory and applications of Petri nets in the modeling and design of digital circuits and parallel systems. For 20 years, from 1960 to 1980, he worked with his colleagues (in the group of Professor VI Varshavsky) with science and applications (for example, developing new circuitry and reliable on-board computers) at the Computing Center of the Leningrad Branch of the Mathematical Institute. V.A. Steklov Academy of Sciences of the USSR. From 1981 to 1989, he worked as an associate professor at the Department of Software and Computer Applications at LETI named after Ulyanov-Lenin (now St. Petersburg State Electrotechnical University). 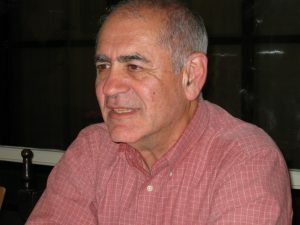 In the 90s, after emigration to the United States, he worked as an adjunct professor at Boston University, as well as a researcher at Harvard University. Co-author / author of five books, about two hundred different publications, textbooks, articles and reviews, more than 40 certificates of authorship for inventions. Among his students are professors from universities in Russia, the United Kingdom, the United States, Finland and other countries, employees of institutes of the Academy of Sciences of the Russian Federation, such as the Institute of Management Problems, as well as well-known domestic and foreign companies such as Intel, Cadence, Xilinx, etc. Leonid Yakovlevich was distinguished by the innate ability to see in people only positive qualities, to help everyone and in everything, and of course an extraordinary sense of humor. This is a great loss for a huge number of people everywhere, all who were lucky enough to know or hear about him. Rest in peace, dear Leo! I recently enjoyed e-mail exchanges with Ed Dellian. Ed is one of the very few modern philosophers and science historians who read Newton’s Principia in original (and produced his own translation of Principia to German – published in 1988). Ed’s position is that the real physical (Nature’s) laws reflect cause and effect in the form of geometric proportionality. The most fundamental being E/p=c, where E is energy, p is momentum and c is velocity – a proportionality coefficient, i.e. a constant associated with space over time. This view is in line with the Poynting vector understanding of electromagnetism, also accepted by Heaviside in his notion of ‘energy current’. It even is the basis of Einstein’s E/mc = c.
The diversion from geometric proportionality towards arithmetic proportionality was due to Leibniz and his principle of “causa aequat effectum“. According to Ed (I am quoting him here) – “it is a principle that has nothing to do with reality, since it implies “instantanity” of interaction, that is, interaction independently of “real space” and “real time”, conflicting with the age-old natural experience expressed by Galileo that “nothing happens but in space and time” “. It is therefore important to see how Maxwellian electromagnetism is seen by scholars. For example, Faraday’s law states an equivalence of EMF and the rate of change of magnetic flux – it is not a geometric proportion, hence it is not causal! My view, which is based on my experience with electronic circuits and my understanding of causality between and energy and information transfer (state-changes), where energy is cause and information transfer is effect, is in agreement with geometric proportionality. Energy causes state-transitions in space-time. This is what I call energy-modulated computing. It is challenging to refine this proportionality in every real problem case! If you want to know more about Ed Dellian’s views, I recommend visiting his site http://www.neutonus-reformatus.de which contains several interesting papers. A causes B – what does it mean? There is a debatable issue that concerns the presence of causality in the interpretation of some physical relationships, such as those involved in electromagnetism. For example, “the dynamic change in magnetic field H causes the emergence of electric field E”. This is a common interpretation of one of the key Maxwell’s equations (originating in Faraday’s law). What does this “causes” mean? Is the meaning purely mathematical or is it more fundamental, or physical? First of all, any man-made statements about real world phenomena are not strictly speaking physical, because they are formulated by humans within their perceptions, or, whether we want it or not, models, of the real world. So, even if we use English to express our perceptions we already depart from the “real physics”. Mathematics is just a man-made form of expression that is underpinned by some mathematical rigour. The interpretation problem, when taken outside pure mathematics leads to the question, for example, of HOW QUICKLY the RHS causes the LHS? And, here we have no firm answer. The question of “how quickly does the cause have an effect” is very much physical (yet neither Faraday nor Maxwell state anything about it! ), because we are used to think that if A causes B, then we imply some temporal precedence between the event associated with A and the event associated with B. We also know that it is unlikely that this ‘causal precedence’ will effect faster than the speed of light (we haven’t seen any other evidence of information signalling acting faster than the speed of light!). Hence, the causality with the speed of light is something that may be the result of our causal interpretation. But, then this is probably wrong to assume that Faraday or Maxwell gave this sort of interpretation to the above relationship. Worth thinking about causality, isn’t it? I have no clear answer, but in my opinion, reading the original materials on electromagnetic theory, such as Heaviside’s volumes, rather than modern textbooks would be a good recipe! I gave a talk on How to Design Little Digital, yet Highly Concurrent Electronics? RP Computing is a discipline of designing computer systems, in hardware and software, which operate under definite power or energy constraints. These constraints are formed from the requirements of applications, i.e. known at the time of designing or programming these systems or obtained from the real operating conditions, i.e. at run time. These constrains can be associated with limited sources of energy supplied to the computer systems as well as with bounds on dissipation of energy by computer systems. These define areas of computing where power and energy require rationing in making systems perform their functions. Different ways of categorising applications can be used. One possible way is to classify application based on different power ranges, such as microWatts, milliWatts etc. Another way would be to consider application domains, such as bio-medical, internet of things, automotive systems etc. These define typical scenarios where power and energy constraints are considered and put into interplay with functionalities. These scenarios define modes, i.e. sets of constraints and optimisation criteria. Here we look at the main paradigms of using power and energy on the roads. Power-driven: Starting on bicycle or car from stationary state as we go from low gears to high gears. Low gears allow the system to reach certain speed with minimum power. Energy-driven: Steady driving on a motorway, where we could maximise our distance for a given amount of fuel. Time-driven: Steady driving on a motorway where we minimise the time to reach the destination and fit the speed-limit regulations. Hybrid: Combinations of power and energy-driven scenarios, i.e. like in PI (D) control. Similar categories could be defined for budgeting cash in families, depending on the salary payment regimes and living needs. Another source of examples could be the funding modes for companies at different stages of their development. These define elements, parameters and characteristics of system design that help meeting the constraints and optimisation targets associated with the paradigms. Some of them can be defined at design (programming and compile) time while some defined at run-time and would require monitors and controls. First of all, I would like you to read my previous post on the graphical interpretation of the mechanisms of evolution of X and Y chromosomes. These mechanisms clearly demonstrate the greater changeability of the X pool (in females) than the Y pool (present only in males) – simply due to the fact that X chromosomes in females merge and branch (called fan in and fan out). The next, in my opinion, interesting observation is drawn from the notions of mathematical analysis and dynamical systems theory. Here we have ideas of proportionality, integration, differentiation, on one hand, and notions of combinationality and sequentiality on the other. If we look at the way how X-chromosomes evolve with fan-in mergers, we clearly see the features akin to proportionality and differentiality. The outgoing X pools are sensitive to the incoming X pools and their combinations. Any mixing node in this graph shows high sensitivity to inputs. Contrary to that, the way of evolution of Y-chromosomes with NO fan-in contributions, clearly shows the elements of integration and sequentiality, or inertia, i.e. the preservation of the long term features. The presence of both male and female genetics are essential for stability of the evolution and survival of the kind, much like the PID feedback control helps stability of dynamical systems, and much like the combination of combination and sequential circuits allow computer systems to operate according to their programs. Again, I would be grateful for any comments and observations! PS. By looking at the way how our society is now governed (cf. female or male presidents and prime ministers), you might think whether we are subject to differentiality/combinatorics or integrality/sequentiality and hence whether we are stable as a dynamical system or systems (in different countries). Alex Yakovlev on Happy Chinese New Year!